As Ramadhan draws to a close, Muslims around the world will be busy in preparation for Eid. This is usually my most favorite time of the year. Counting the days for Ramadhan to finish and eagerly awaiting the sighting of the new moon to celebrate Eid. Uusually the night before Eid, last minute presents are packed, last minute cookies are baked and last minute alterations made for the lunch menu. Pristine new clothes are laid out to be worn the next day and hands are adorned with traditional henna. Same rituals and traditions every year. Yet, renewed excitement each year as well. Our menu normally includes biryani, samosas and sweet vermicelli. Children excitedly tearing through wrapping paper and adults counting their cash to give away. Before the month of Ramdhan bids us goodbye, I want to share one last recipe for foods that normally grace our Iftar tables. Vibibis are the Tanzanian take on the American pancake. The batter is made up of rice and dessicated coconut mixed with milk and coconut milk. 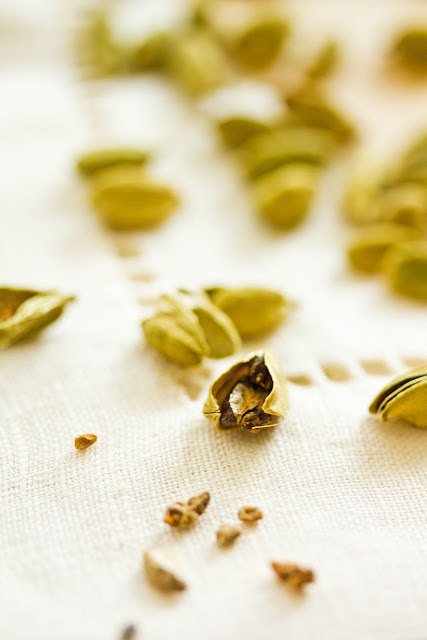 A touch of cardamom and you have a perfect snack with cardamom tea. Light and airy like clouds. So for all those celebrating Eid, and also for those who aren't, I wish you a time of laughter and family, of togetherness and charity, of love and sweet treats. I'm sending these vibibis to my friend Kulsum who is hosting this month's Monthly Mingle, the theme being yeasted doughs. Rinse both types of rice together and soak overnight in water. Drain the next day. Add rice to a blender along with coconut milk and blend until smooth. Add sugar and yeast and blend for a further 5 minutes. Add 1/4 cup milk and dessicated coconut and blend again until the batter is completely smooth. Pour into a bowl and cover for 1 hour until the batter has risen and doubled.Add the rest of the 1/2 cup of warm milk and cardamom powder. The batter should have the consistency of pancake batter. If it is too thick, you can add a little bit more warmed milk at your own discretion. Add a few drops of oil to a non stick frying pan over low to mediumheat. Pour a small amount of batter to your desired pancake size (I used teh half cup measuring cup) and immediately cover with a glass lid. Let it cook for a minute or so or so until you will see small holes appear all over the pancake, like a sieve. The top will be cooked by the steam. At this point the pancake is ready. Repeat until all the batter is finished. You may find that as the batter stays, it becomes thicker. You can add more warm milk to get the right consistency again. Also, if you find that small holes are not appearing whilst frying the pancakes, your batter is probably too thick and a small amount of warm milk can be added again. Place the pancakes in a hot pot until they are ready to be served. Stack the first one with the brown side down and the second one with the white side down. Continue this way so that teh brown sides are always in contact and the whites are touching. Best served warm. 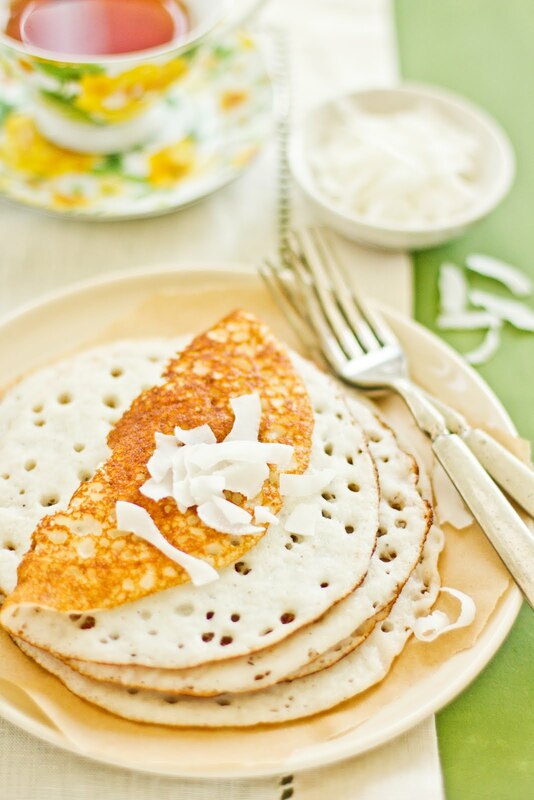 i love it that this pancake has coconut ! it is like making a dosa/appam :) looks yumm ! I love different kind of pancakes. This looks yummie too! It looks like dosa (south Indian breakfast). A very interesting recipe. And lovely snaps. Mmmm, those look tasty. I especially like that they're only cooked on one side. Mmm this looks so delicious -- I'm trying to put off lunch until a decent time and thus killing time at the library. This is making me hungry again though! Have a very happy Eid...I am in India visiting family and here I can see all the preparations going on in full swing for Eid too...gorgeous food everywhere and I look forward to tasting Sevaiyan at my friend's. Some of your best photographs esp the the shot of the cardamom. We in south of India make a similar version of these pancakes. Eid Mubarik, Sukaina! The celebrations must be so fun in Dubai. 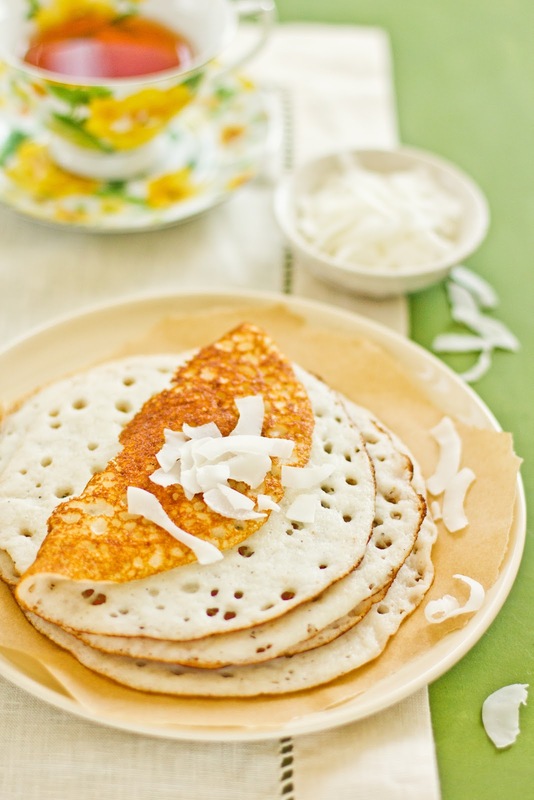 These Tanzanian pancakes look very yummy, coconut and cardamom - mmmm. I am bookmarking this one too! I make the wheat flour crepes with coconut filling and tho' this one has way diff. ingredients, it looks very similar. Love the flavor of the coconut and the coconut milk. and it uses yeast! Eid Mubarak to you and your family! Best wishes. I really enjoy and like your blog, its beautiful. What gorgeous pancakes Sukaina! I've never heard of them before I love the sound of the rice and coconut combination. Your photos, as always, are simply stunning too. Loving the ingredients list: Rice and coconut and suagr...what a heavenlu combination. Will try these soon. Eid Mubarak, Sukaina! Gorgeous clicks! Rice, coconut and sugar. You can't go wrong with that. Delicious pancakes S! The lace like thinness of these pancakes actually reminds me of the French version - crepes. Although those are made with flour not rice. I love the idea of the rice and coconut together, sounds wonderful. Omg, wat a fabulous looking pancakes,seriously feel like having some.. This is one interesting recipe! I love the idea! I wish I could live with you for a month....shopping, cooking, learning. These are interesting and beautiful and and I love that there is only one side. Off to Google the things I'm not familiar with. These look so light and airy! OMG Sukaina, gorgeous! I want these pancakes for super later dinner right about now!! very light and fluffy pancakes! They remind me of the Semolina Dosas we have in India. happy Eid! Looks great Sukaina. I certainly want to try this, I always have coconut around in my fridge! Have lots of food and fun this Eid. The pancakes really look airy! Have to find the ingredients first to try making them though. Oh how lovely they look - truly like fluffy clouds! Can just imagine the wonderful flavours. And I love your description of the excitement and anticipation preceding Eid :) Wishing you and your family a blessed and joyous celebration. Wow! We are all closer than we think. This dish is an example. Miles apart, we still have similar dishes. 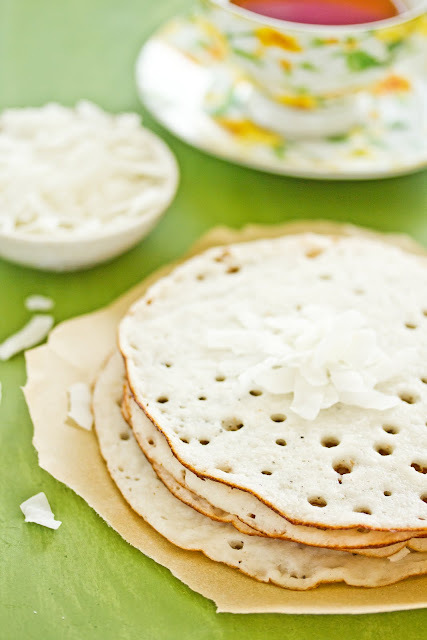 I had never known coconut pancakes to be from Tanzania or even Middle East, they are common in South India. Eid Mubarak to you and your loved ones..
Just found you through foodgawker and I'm so glad I did. These look so light and airy and the photography and styling are the perfect complement to them. It actually makes me wish it was spring! Eid mubarak. I bet Eid in Dubai is a totally difference experience to what I have in Denver!We moved from Houston last year and Ramadhan and Eid just don't feel the same without all my family. I try and make it exciting for the kids so alhamdulillah, we had a good time yesterday. Your pancakes and photos of them look beautiful. My mum uses to make the Indian versions of them. They look delicious! Would whipping cream be thick enough before it was whipped? Awesome post & congrats on TOP 9! Wow, I'm going to try this recipe. I'm glad I found you. Whoa, what unique pancakes! I'm always looking for something different to do with one of my favorite meals, breakfast, so these are right up my alley! Thanks for everyone's kind comments. Yes, I have eaten appams before and these are similar but on the sweet side. Charles- I have never used cream before so would be interested to know how it will work out if you do try it. Howvere, I'm not sure what you would substitute for the dessicated coconut. How beautiful. These look so delicate and sound delicious. Coconut is one of my favorite flavors. Your pictures are such a breath of fresh air! Would you just serve these as is? Or is there some sort of syrup, chutney, or other topping that would be perfect with them? Hi Dorothy. The pancakes are very moist and aren't traditionally served with any topping or syrup. They are usually eaten with tea or coffee on the side though. Jasmin rice has no jasmin but it is a sticky rice- like rice used in Thai cuisine. You can use any type of 'fat' rice. I found your blog thru a link my good friend Marla just gave and your photography and food is just beautiful! They look beautiful, light and airy. Pancakes looks lovely just like your blog. Your pictures, food styling and writing is fantastic. I'm new to your blog and just discovered it because I saw the announcement for DMBLGIT on foodgawker. And wow, I'm really impressed with your photography! Looks absolutely breathtaking. I will definitely be coming back! I am trying to stick to my weekly menu but this is tempting. how interesting. I love cardamom, not all that thrilled with the texture of coconut, altho' I like the taste. These look good. 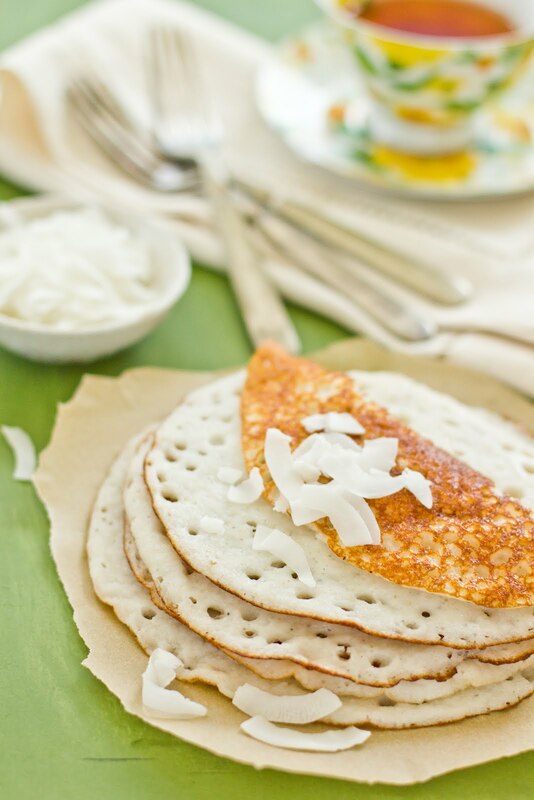 Stumbled onto your blog from Foodbuzz and congrats on your recipe being featured:)This is a lovely pancake and I can almost smell the smoky aroma of rice and and coconut cooked together - lovely recipe,lovelier photos and I'm so glad that I came! Make sure the children know that the professional moving vehicle is not a position where they can play. They should know that it is a aspect of protection to keep variety from moving organizations carrying huge furnishings. Awesome blog you have shared. I really liked this post. Your recipe is so yummy and delicious. Thanks for sharing this post with us. Thank you so much for sharing the recipe. I'm glad to find it here.